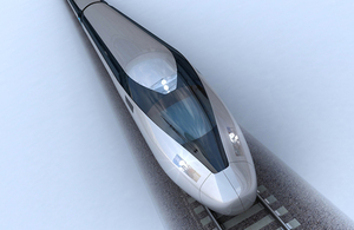 HS2 Ltd has announced a shortlist of five firms bidding for a £2.75bn contract to build trains for the new high speed rail line, after transport secretary Chris Grayling warned the new trains must deliver jobs and skills in Britain. The shortlisted firms are: Alstom Transport; Bombardier Transportation UK Ltd; Hitachi Rail Europe; Patentes Talgo S.L.U; and Siemens PLC. The contracts will cover the design, build and maintenance of at least 54 trains coming into service from 2026. Chris Rayner, HS2 Ltd managing director - Railway Operations, said: ‘It’s great to see such a strong line up of experienced high-tech manufacturing and design talent. Together with the successful bidder, HS2 will deliver some of the world’s most advanced rolling stock, engineered to provide seamless, accessible, fast and reliable journeys. Prior to the announcement, Mr Grayling said: ‘I am determined to see the great HS2 train building programme create huge opportunities for British workers and drive economic growth in our country. HS2 Ltd said the first trains will reach of 225mph (360kph) and will begin to roll off the production line in the early 2020s. The bidders will be invited to tender next spring, with contracts awarded in 2019.